Thyroid hormone is one of the main metabolic regulators in the body. It virtually affects every cell and if nutrients will be used for energy or stored. Thyroid hormone comes from the thyroid, a gland located in the front of your neck, with one lobule on each side of your Adam’s apple. The thyroid produces two types of Thyroid Hormone (TH), T3 and T4 in a ratio of approximately 10:1, T3 being at least 5 times more active than the T4. The number stands for how many iodine molecules are attached to the protein. Iodine is essential for the making of TH. The hormones are bound to Thyrosin Binding Globulin (TBG), a carrier protein, in the blood and transported to all the corners of the body. They are inactive while bound to the carrier. The hormones are fat soluble and can therefore pass through the cell walls and be stored for later use. T4 is converted to T3 by the deiodinase system, that most cells have, but being most prominent in the liver, skeletal muscle, the gut and the brain. Selenium is needed for the deiodinase system to work properly. TH act on Thyroid Receptors located on our DNA and it promotes the copying of the genetic code so that the cell will make more of certain proteins that will enhance the metabolism. 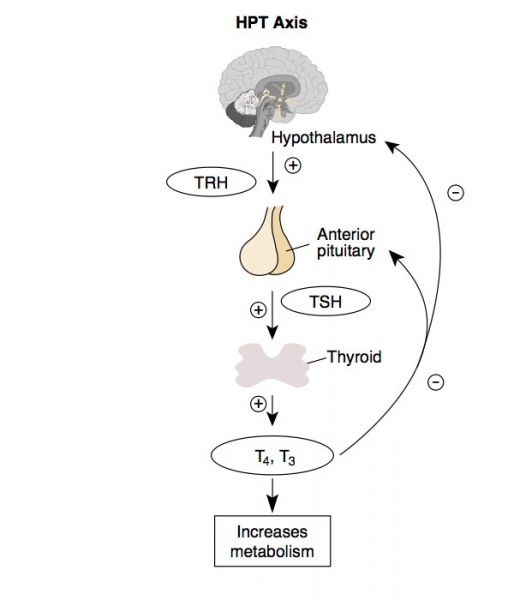 The release of TH is regulated by a hormonal chain called the Hypothalamus-Pituitary-Thyroid (HPT) axis. The hypothalamus is a part of your brain that takes in a lot of information about your body through a variety of sources and processes it to appropriate signals. It orchestrates a myriad of actions in the body, the HPT axis being one of them. If more TH seems to be needed, it will produce and secrete Thyroid Releasing Hormone (TRH) that will be sent through the blood to a part of the pituitary gland. This little pea-sized gland, in the bottom of your scull, produces six hormones that all have effects on other glands in the body.Relevant in this case is TSH – Thyroid Stimulating hormone, that will be secreted when TRH arrives. The TSH will travel through the blood (taat means it will also be available for all the other cells in the body) to the Thyroid gland and this will shake the gland into action, building and releasing more TH. There is many ways in how this axis can be regulated, one being the TH itself having a negative feed-back on the thyroid, pituitary and hypothalamus. So the actual release of the hormone will automatically shut down the signal for making it. A very common way for the body to tightly regulate it’s systems. Some other factors that are important are stress, mediated through the hormone, cortisol. High levels of cortisol affects the conversion of T4 to active T3 in the cells, shifting the balance into making more of the inactive reverse T3 version. High levels of stress promotes the release of Corticotropin Releasing Hormone (CRH) which stimulates the adrenal glands (walnut shaped small glands sitting on top of your kidneys) to release cortisol. CRH inhibits TSH release from the pituitary and so lowers TH levels. There is also a link between the health of the gut and thyroid health. Stimulates the metabolism of fat, carbohydrates and proteins, with some small differences between the tissues in the body. Stimulates the cells to make more LDL-receptors so it can take up more cholesterol to be used for the making of bile acids, hormones, build it into the cell wall etc. Increases fat mobilization from fat cells and the burning of fatty acids in the cells. This will increase the amount of triglycerides available in the blood. Makes the cells take up, build and burn glucose. Regulates the inflammation in the body, especially the gut. It keeps the inflammatory cells in the gut walls in check. 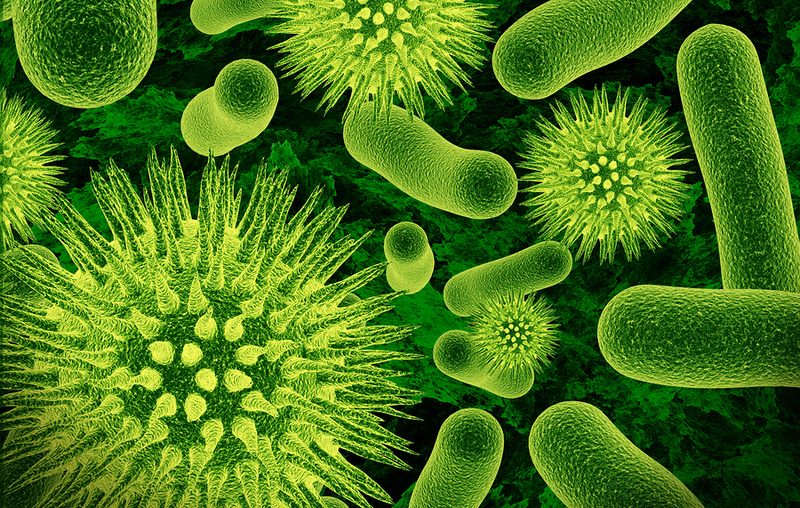 TRH and TSH also stimulate the building of GALT, patches of inflammatory cells in our gut wall that check for pathogens and potentially harmful agents in our food. Lowers Blood pressure through the relaxation of the blood vessel walls, enhancing the blood flow through the body’s tissues and organs. Stimulates the heart to pump more efficiently by affecting the way it relaxes between beats and also by stimulating protein metabolism to build good muscle. Super important for the normal development of the brain in the fetus, promotes putting down myelin (the fatty, insulating sheets around the nerves). It also has profound effects on the state of alertness for humans, too little will make you sluggish, too much hyperactive. So TH is essential for your metabolism to be efficient and balance storage and usage of energy. It’s also essential for the normal growth in children, together with growth hormone. It is intimately intertwined with other hormonal and non-hormonal systems in the body, so a dysfunction is rarely a direct result of one organ or hormone. Hypothyroidism (too little TH) can be because a disease only affecting the thyroid gland, but usually it has it’s roots in other imbalances, because of stress, autoimmune disease, gut disorder or something else that tilts the delicate balance that constitutes the homeostasis (regulated stability) of your body.